The legality of gambling in Oklahoma is a curious case – while the state is home to five-dozen native and commercial casinos and racetracks, other forms of betting are tightly-controlled. Like most other US states, Oklahoma law prevents access to any legal sportsbook bets. According to the Oklahoma criminal code (which I go into more detail about below), bets on sports over the Internet may even be illegal. Oklahoma should be a sports bettor’s paradise. In this part of the country, with football-crazed Texas to the south and Oklahoma’s own rich tradition of sports excellence, sports are a sort of religion. High school and college athletics are as vital to Oklahoma culture as its Native American heritage or conservative politics. Now that Oklahoma City has a successful sports franchise in the Oklahoma City Thunder, the state is slowly gaining traction as a home for sports action. Let’s look at details of sports in Oklahoma and take a further look at Oklahoma gambling law. The only major-league professional team in Oklahoma is the Oklahoma City Thunder. Established in 1967 as the Seattle SuperSonics, a successful squad that moved in 2006 as part of a business deal involving Starbucks CEO Howard Shultz. The team premiered in Oklahoma City in 2008, and was quick to make a name for itself, earning a playoff berth in its second year of existence. The team has made the playoffs every season since. The Thunder have had more playoff success in less time than any other major-league US team, and the fans are behind them in a big way. The Thunder now have the highest home game attendance percentage in the league, and are a perennial title favorite. OU, as the school is called, is a traditional NCAA powerhouse in all major sports. The Sooners field 19 varsity sports squads, most famous of which is their D-1 football program. Sports Illustrated called The University of Oklahoma one of the three best sports programs in America. OU has the highest historical winning percentage of any D-1 football team in history, with seven outright championships and nine contested titles to their credit. OU basketball is ranked second in NCAA tournament wins, though the team holds no national title yet. OU baseball can claim two national titles as well as countless pro draft picks and eventual superstars. Oklahoma fandom is intense, concentrated around Norman and the more rural areas of the state. Stillwater, Oklahoma is home to the OSU Cowboys, not quite as storied as the OU Sooners but with a proud heritage of athletic competition. Though Oklahoma State has more team sport NCAA titles than Oklahoma, the majority of them have come from small-market sports. That being said, OSU football holds two basketball titles and a baseball championship. OSU is traditionally more of a basketball powerhouse, and since the school is just sixty miles from OU fans in Norman, there is a rich rivalry between the two teams. Oklahoma is a standout case in the American South – a state that allows for a good deal of gambling options. Because of the state’s close ties to the Native American population, it is a hotbed of tribal gaming operations. I’d like to point out that gaming in Oklahoma is heavily-regulated. Three regulatory bodies are charged with the regulation of the gambling industry – the Oklahoma Office for State Finance Games Compliance Unit, the Oklahoma Charity Gaming Enforcement for charitable gaming, and the Oklahoma Racing Commission. Because of that intense amount of scrutiny, Oklahoma’s gaming laws are pretty explicit. If a person “… opens, conducts, or carries on either poker, roulette, craps or any banking or percentage, or any gambling game played with dice, cards or any device, for money, checks, credits, or any representatives of value, or who either as owner or employee, whether for hire or not, deals for those engaged in any such game, shall be guilty of a felony.” The fine imposed is between $500 and $2,000 AND imprisonment in the State Penitentiary for 1 to 10 years. This is an extreme penalty, even by American standards. One interesting twist to this whole affair – since Oklahoma is so explicit in their legal code, it’s safe to assume that you cannot be prosecuted for an offense of Web-based gambling by the state government. Because there is no law against placing a bet at an online sportsbook, it may be safe to assume that you can safely place wagers at offshore books. But remember – I’m not a lawyer, and I don’t intend this to be read as actual legal advice. If you live in Oklahoma and are concerned with the legality of your wagers (especially considering the harsh penalty outlined above), you should consult a lawyer familiar with Oklahoma law. 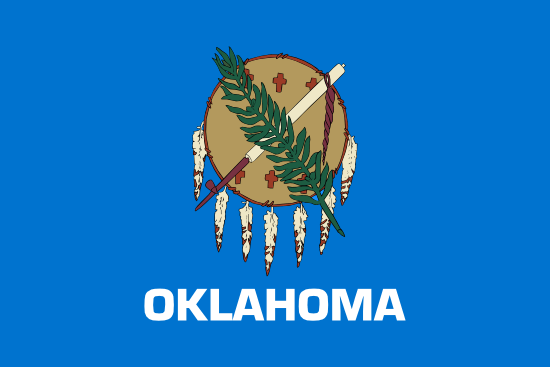 Citizens of Oklahoma are lucky in some ways – they have legal access to tribal casino gaming as well as commercial racino operations. Unfortunately for sports bettors the state doesn’t allow for any sportsbook operations. There is no legal way to place a sports bet in the state of Oklahoma. From a cursory reading of state law, it appears there is no restriction on Web-based sports bets. Though Oklahomans love their college football and NBA basketball, the state doesn’t yet have a regulatory framework in place for offering wagers on athletic events.